Blog The lack of physicians and health emergencies in rural or isolated areas is a cause of deaths that could be prevented with the help of technology. The lack of physicians and health emergencies in rural or isolated areas is a cause of deaths that could be prevented with the help of technology. The lack of physicians and health emergencies in rural or isolated areas is a cause of deaths that could be prevented with the help of technology. Indeed, health monitoring devices can help patients to continuously send their health data such as heart rate or body position to a remote health-care facility where physicians can get notifications, send assistance or start specific actions depending on the situation. That’s where connection to the Cloud, that acts as a virtual server to store, analyze data and notify the responsible facility accordingly, becomes crucial. In the previous articles, we explained how we developed a Qt application that displays health data on the AM437x board with GPU acceleration. Health data is highly valuable and displaying them to the patient does not make sense if they are not somehow analyzed or at least stored somewhere. As the board will not be able to store and process such amount of data, only Cloud technologies can answer this issue. This article intends to describe how to exploit (store, analyze, visualize) these data using Cloud technologies. The health monitoring device has been designed along with a web application as a proof a concept to show how easy it is to deploy on the Cloud using Amazon Web Services (AWS). 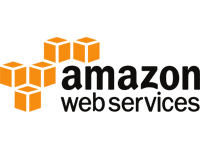 AWS is a suite of cloud computing services that offers cost-efficient and scalable services for storage (database) and computing capacity (application) with a high-level of synergy between them. In the Cloud, an application processes the data and triggers an alert is something goes wrong. In our case, a text message will be sent if the heart rate stays at 0 BPM. How to store your health data into the Cloud ? The device monitors and stores the health data for analysis in a database located in the Cloud. The columns of the table would be the Patient UUID to uniquely identify the patient and the following health data. Such data would be: Galvanic Skin Response, Electromyogram (EMG), Electrocardiogram (ECG), Air Flow Breathing (AFB), Heart Rate (in BPM), Temperature, SpO2 (Peripheral Capillary Oxygen Saturation) and the Body Position. In our case, we want to design a database with only one table containing the data of one patient. We do not need to draw relations between multiples tables. Therefore, a simple non-relational database to store our data is enough. We could choose between Amazon DynamoDB and Amazon SimpleDB but as the former is seamlessly scalable and fast as the latter, Amazon DynamoDB will be chosen to answer our needs. The data is sent to the Amazon DynamoDB service in JSON format. In our use-case, only the INSERT (PutItem) query is used. 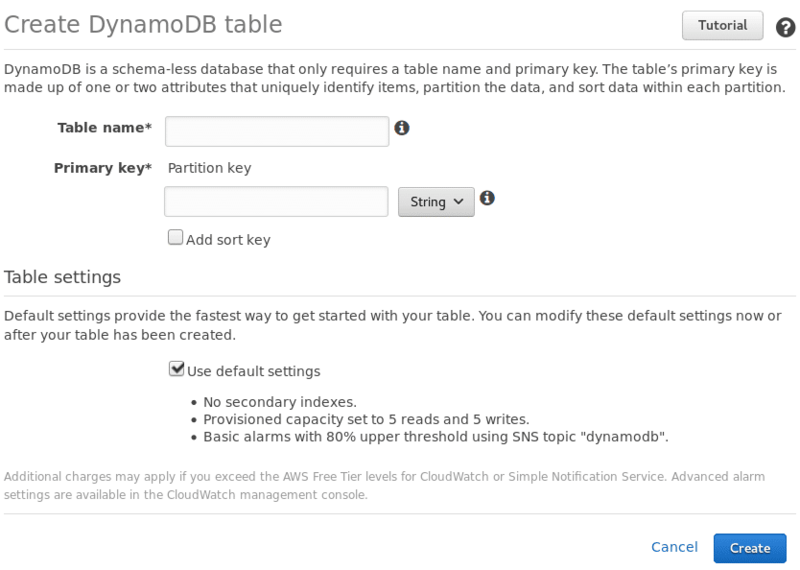 To create a Table in DynamoDB, go the the DynamoDB service and click on Tables, then on Create Table. In Illustration 1: Create a table in DynamoDB, the PatientData table is created with the data UUID as the Partition Key. In DynamoDB, a table is defined by a name and a Partition Key (or Primary key). A Sort Key can also be defined. In Illustration 3: PatientData table, the PatientData table contains all the health metrics with the PatientUuid reference. This database is populated by the health monitoring device application through HTTP POST requests. When the health data meet some conditions, the Cloud should send a text message to the health facility to notify on the patient’s state and trigger an action from medical staff. In our use-case, the business logic to implement is simple enough to rely on the serverless solution AWS Lambda. This service handles the execution of a function without managing servers. With Amazon DynamoDB, they are the core components of the AWS Serverless Platform. The main advantage of AWS is that all the services are perfectly integrated in each other: these functions (or Lambda) can be caused by an event in Amazon DynamoDB or Amazon S3 bucket or be invoked through the Amazon API Gateway. The AWS Lambda will be activated whenever an item in the table is modified. The relation between a Lambda and a set of specific DynamoDB events is called a trigger. In Illustration 4: Create a Trigger, we create a Trigger between the table PatientData and the function ProcessDynamoDBStream. In our case, the implemented AWS Lambda retrieves the data inserted in the database, gets the patient’s first and last name from the UUID using DynamoDB and checks if the last six samples of the patient’s heart rate is zero. In that case, a text message is sent. It defines the concept of “topic” as a: “communication channel [used] to send messages and subscribe to notifications.” It allows to send text messages to multiple phone numbers at once . As we send the alert to a single phone number , we use the Amazon AWS SDK (boto3) that provides an easy-to-use API removing the need of a topic. Relying the application in the cloud saves time and allows to get rid of scalability issue. But the cloud resources cost money and their use should be carefully monitored. The Amazon CloudWatch service enables to visualize and track every metrics of every used Amazon services. An alarm can be enabled to notify if some metrics has hit a threshold. This article described the deployment of the patient monitoring solution in the Cloud. This has been tested using Amazon Web Services (AWS) and its services. However, multiple aspects provided by AWS API have not been explained such as the AWS Identity and Access Management (IAM) that provides control access management features to the AWS resources. Now that we have the data available in the Cloud, we will need some tools to visualize and monitor efficiently these data.